My adoration of goat cheese apparently knows no bounds. I shoved it inside of ice cream. It’s not weird, I swear. It’s not like chunks of goat cheese. The goat cheese is melted into the cream base and we go from there. See? It’s not so bad. OH. And it’s melted with tons of rich chocolate. I’ve been inspired to make goat cheese ice cream for what seems like ever – after having a version of Jeni’s ages ago. Best ice cream on the planet, according to me. Have you been? Okay. If not… you should probably have a pint delivered to your door. Because you can do that these days. Hello, 2014. I like you. This… tastes… like… CHEESECAKE. Chocolate cheesecake, to be exact. It’s super tangy yet sweet and wonderful. It reminds me of a chocolate cheesecake that my aunt used to make back in the day. And it’s studded with fudgey chocolate ganache chunks. All I did was whip up some ganache, chill it until firm, scoop up mini “truffles” and throw them in the ice cream mid churn. 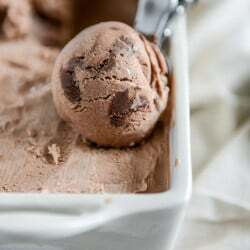 A milk chocolate ice cream with dark chocolate fudge. This is just one of many in a long line of chocolate ice creams that Eddie deems abnormal and then starts shouting WHY CAN’T YOU JUST MAKE REGULAR CHOCOLATE ICE CREAM?! Because I can’t. I just can’t. Because I say so. Because it’s too boring. This is as close to boring as we’re going to get – plain old chocolate ice cream but stuffed with goat cheese and fudge chunks. It’s as close to nontrashy as I come. Allow the goat cheese to sit at room temperature for an hour or two so it softens. Once it’s soft, add it to a large bowl and whisk it until it’s somewhat creamy. This will take a few minutes. Add the heavy cream, milk, sugar, cocoa and corn syrup to a large saucepan and heat over medium heat. Whisk constantly until the sugar dissolves and the mixture comes to a boil, then reduce the heat to low, Whisk in the chopped chocolate and remove it from the heat. Pour it over the goat cheese while whisking. Stir and whisk until the goat cheese melts completely into the cream – this will take about 5 minutes or so, but no little white chunks should remain. Place the bowl in the fridge to chill for an hour or two. To make the ganache fudge, add the chocolate to a large bowl. Heat the heavy cream over medium-low heat in a saucepan until it’s just bubbling along the edges. Pour it over the chocolate and let it sit for 1 minutes, then whisk continuously until a thick ganache forms. Press a piece of plastic wrap directly on top of the surface and refrigerate until thick and chilled, about an hour. Remove the ice cream base from the fridge and churn according to your ice cream maker directions. I use the attachment on my kitchenaid and churn for about 25 minutes. The last 5 minutes, remove the ganache from the fridge and spoon chunks of it into the ice cream. Pour the ice cream into a freezer safe container and add a few more ganache spoonfuls where ever you wish. Cover the ice cream and freeze for 4 to 6 hours before serving. Wow I want to make this soon!! I love goat cheese and wonder how it tastes in ice cream. This sounds SO insanely good!!! I’ve made a cherry cheesecake goat cheese ice cream and loved it. But this, this sounds SO decadent and love the ganache chunks. Yowza! I LOVE goat cheese and never thought of it with chocolate! I have wanted to make goat cheese ice cream for a while, but it is too cold! Boooo! This looks crazy good and I am pinning for later! Thank you David, thank you, thank you!!! I’ll let you know. You should be punished for those photos!! Oh I really need to buy an ice cream maker, this looks so good! This looks amazing! My husband also gets on my case about refusing to make something “normal,” but he usually ends up liking my “weird” creations anyway. Can’t wait until after my pregnancy when I can eat uncooked goat cheese again! I miss it so much! This ice cream sounds so intriguing and looks so good! Totally just spent 11 minutes (exactly) drooling over this. VIVA goat cheese! Have you ever done goat cheese in place of cream cheese in a frosting. If you love yourself, do it. That picture stopped me in my tracks. I would never have thought you could put goat cheese in an ice cream and it would taste good, but that looks incredible! that’s bizarre, because a few years ago I had Jeni’s goat cheese and sour cherry ice cream, and I’ve proclaimed it the best ice cream I’ve ever had since. Everyone looks at me like I’m crazy when I try to describe it. It was bliss. I wish I had an ice cream maker so that I could make this!! My love for cheese and chocolate are things I thought could never combine. Until now. I think I died and went to heaven. Thanks for sharing, I can’t wait to try this!! YUM! I will eat goat cheese (or chocolate…or ice cream) in anything. This is basically my dream come true. Gorgeous photos – thanks for sharing the recipe! Goat cheese ice cream is such a treat. Chocolate ganache chucks!!! These photos are amazing. This is very very very good. Can’t wait to try it! The craziest thing I’ve put goat’s cheese into was chocolate brownies – I swirled raspberry puree and goats cheese all over the top (like a classy cheesecake-topped brownie). Soooo good!!! I adore goat cheese, and while I never would have thought to use it in ice cream, I’m trusting you 100% that it is delicious. This looks amazing! This sounds completely brilliant to me. In fact, I kind of want to run into my kitchen and make a goat cheese and dark chocolate panini right now. You’re a genius. This is a new one on me, but if anyone can pull it off, you can! Pinned! This is amazing! 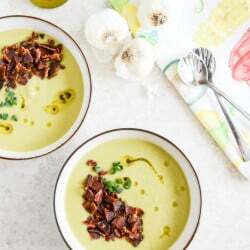 I stumbled across this recipe while trying to find ways to use up the pound of goat cheese we had before it went bad, and man am I glad I did! I did make a couple changes to make it even more chocolatey. Instead of two ounces of chopped milk chocolate, I used 2 ounces of Lindt 85% dark chocolate. And instead of 8 ounces of semi-sweet morsels, I used 8 ounces of dark chocolate morsels. But the texture is PERFECT. And the taste is phenomenal…sweet and tangy!